If you're 40 or beyond, these tips are for you. I just turned 41 a few months ago. If I was job searching today, some places wouldn't think twice about rejecting me for being too old. And you know what? Even if it wouldn't be fair, I don't mind. Every company, every team, is entitled to hire whoever they think will be the best fit. As a job seeker, it's up to you to research companies and teams upfront, before you apply, so you can estimate if you'll be a good fit. 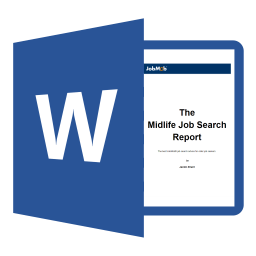 As an older job seeker – 35+, 45+ or even 65+ – it's up to you to research companies and teams upfront, before you apply, to see if they have a history of hiring workers like you so you can better estimate if you'll be a good fit. Here are 40 tips to help you along the way. Don't be defensive and don't omit dates. You've worked hard to get where you are, so be proud of what you've accomplished along the way and be even more enthusiastic about what you have yet to accomplish. Age stereotypes exist no matter how old you are: “the worst thing a job seeker could do is try and emphasize the positive qualities which employers associate” with your age. Play up any qualities you have that are usually associated with younger people. Resist being put off by younger-sounding ads that use terms like ‘fast-paced' and ‘multi-tasking'. Growing a family requires tremendous multi-tasking skills, so know that you can compete with anyone. Everyone knows how difficult it is to keep up with an evolving field, all the more impressive when you've been doing it for a long time. Here are computer skills most in demand right now. Think about the skills you have that are transferable to another industry or profession; it's never too late to find a dream job. Online or off, join a group of people like yourself for support, advice and networking purposes. Join a forum or community on Facebook, LinkedIn, or perhaps a local job seekers club. With a lot of experience, it may be straightforward enough for you to enter consulting, doing the work you know but charging higher prices than former colleagues. Stay healthy by exercising and eating a balanced diet. This is always important, more so when you're in a difficult transition period between jobs. There are over 10 good reasons to do this. 12. Make time for friends and family. Job hunting is similar to actors auditioning for a role; there can be many rejections before a break comes and you will need every bit of encouragement that they can give you. Volunteering is a great way to “keep a work-based routine and keeps you involved in the community” which also translates into many networking opportunities. Here are 10 Best Practices to Volunteer Your Way To a Paid Job. Update your knowledge before sending out resumes. Even if you've been keeping up with new skills and technologies, you may have missed the latest industry jargon and trends. Limit your resume to two pages, and focus on the past positions that are most relevant and impressive with regards to the job you are applying for. If you're interviewed by a younger manager, make a point of describing situations where you worked well with younger people, especially if they were younger leaders. Aim for companies that embrace older workers. SimplyHired 50+ is a job search engine specializing in this domain (US-only, unfortunately). RetirementJobs.com is another. If your kids are old enough that you spend less time with them than you used to, offer to put in hours that are difficult for younger people who do still have family obligations to manage. Registering with a temp agency is a good way to update your skills or learn new ones, especially if you are someone who prefers ‘learning by doing'. List about 15 years' worth of jobs on a resume, and only mention others if you have a compelling reason. Consider a chrono-functional resume style to emphasize relevant skills. Soften the job titles on your CV as necessary to avoid appearing overqualified. Be sure to specify any recent professional training courses you attended in order to demonstrate your willingness and ability to stay up-to-date. Looking for your first salary after a long time as a homemaker or volunteer? Learn to portray your skills as transferable to your next job. Of your resume, of your way of dressing, etc. Look in the mirror, or perhaps have someone do it with you. Prevent yourself from feeling that you missed an opportunity solely because of your age. Most of the time it simply isn't the case, so avoid clouding your understanding of what the issue really was and focus on any potential improvements for the next interview. In addition to JobMob, subscribe to a handful of other great job search blogs. People tend to associate startups with young go-getters and will be more likely to remember a standout older person taking those same risks. Leverage that recognition along with your experience and contacts as you move forward. Plus – with a longer credit history, banks are more likely to help you with financing than a student who only recently opened a first account. … at another company. As you make progress with your new business, job opportunities will arise through your new network of contacts around the startup. Do a startup of a third kind – take the initiative to form a local support group or job club if you can't find one in your area. Many contacts accompany much experience over a long career, and you should use that broad reach to find the people that can help you most, such as with referrals for hidden jobs. Consider boomeranging- returning to work for a former employer. You may still know people on the inside who can vouch for you. Don't try to act young in your eyes, you will just look old in their eyes. Always be yourself- it has gotten you this far already. 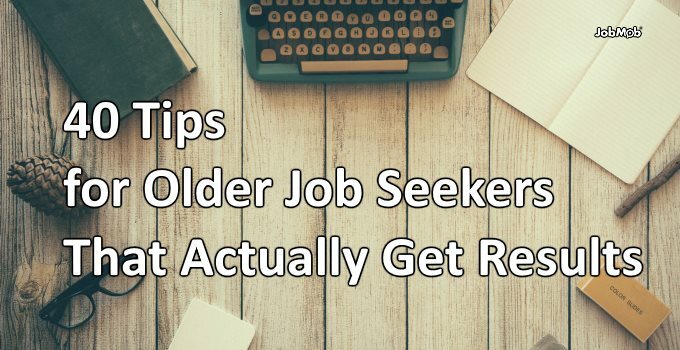 Especially one who understands older job seekers. Subscribe to JobMob via email and follow me on Twitter for more job search tips where there's no such thing as being over the hill. Thanks Peggy. Any favorite tip in particular? Thank you very much for great tips and advice for job seekers. I think there’s a lot of great advice on this blog and as a professional resume writer I’d have to say I agree with almost all of it. The only point I question is about dates. I’ve worked for clients who have a college graduation date of 1978 or earlier. For these situations, I say to simply remove the date. I could see a 22-year-old HR coordinator reviewing that and thinking, “hey, that was before I was born.” For this reason and others, I’d suggest omitting such dates. Lisa- makes sense, let recruiters dig deeper if you manage to get their interest. Thanks for the add. “If I was job searching today, some places wouldn’t think twice about rejecting me for being too old. And you know what? Even if it wouldn’t be fair, I don’t mind. Every company, every team, is entitled to hire whoever they think will be the best fit.” – You may not mind this personally, but technically these companies are actually not entitled to determine best fit according to an age metric – they are in violation of the law when they do so. Most if not all may never face consequences, but it’s essentially the same thing as hiring an all white, all male, blond, blue-eyed team and saying it’s the “ideal culture” for their business. Ageism, the only form of discrimination still freely allowed and encouraged. Yes, the quote sounds bad out of context (like so many other things…) but I stand by it: job seekers don’t have the time to go on a crusade, meritorious as it may be, they want to end their job search asap and should work towards that. Join the crusade, absolutely, once your job search situation has stabilized. As for ageism being freely allowed or encouraged, certainly not by me. It’s true that ageism is startlingly common, but where do you see it freely allowed and encouraged?